Good Answers on Your Questions! Does it cost the recipient to receive messages? Can people reply to my SMS? How many characters can I include in my SMS? Do you give free SMS credits? I have done the free trial of your service and it is great. How do I purchase credits? What countries can you send messages to? A message I sent was not received. Why? How do I know that my SMS has been received by the recipient? Is it possible to delay sending the message? How do I enter my contacts into my contact book? My friend shares his mobile with his family. Can I have the same mobile number listed in my contacts book under more than one person? I am sending a bulk SMS, can I personally address all my recipients? How to add my contact to my favorite contacts list? How do you send an SMS from email? I am a software developer and I would like to integrate your SMS gateway to my website or application. What do I do? Do you provide 2-Way SMS numbers? How to use Auto Contact Group Creation? Can I used your service from my internet enabled WAP phone? Can I give friends or employees access to my account or credit without giving them my password? I sent an SMS with less than 160 characters but I was charged more than the number of credits per SMS then cost stated on your Pricing and coverage page. Why did this happen? I have scheduled some SMS to be sent periodically at a later date and time. How do I cancel this? How do I send SMS discount codes and special offers to my customers with an option to Opt-out option of future offers? How do I set up SMS templates? Can I send SMS messages through your service that is in Russian, Arabic, Chinese or Japanese? 1. Does it cost the recipient to receive messages? 2. Can people reply to my SMS? 3. How many characters can I include in my SMS? 4. How much does it cost to send an SMS? 5. Can I use your service from anywhere in the world? 6. Do SMS credits expire? 7. Do you give free SMS credits? 8. How do I start using your service? Click on the red "Join Now" button. Fill in your details on the form including your mobile number and click the "Submit | Go" button at the bottom of the form. The next page will ask you to enter a verification code. An SMS with the verification code will be sent to the mobile phone number that you registered in Step 3 within 5 minutes (usually sooner). You can now start sending SMS messages. 9. I have done the free trial of your service and it is great. How do I purchase credits? 10. How do I change my registered mobile number? Click on the "Account" link on the top right hand corner of the page after you login. Your profile will appear. Change the mobile number to the new mobile number and click "Submit | Go" button at the bottom of the form. 11. What countries can you send messages to? 12. A message I sent was not received. Why? 13. How do I know that my SMS has been received by the recipient? 14. Is it possible to delay sending the message? 15. How do I enter my contacts into my contact book? Click on the Send SMS page and click on the "Contacts" button at the bottom of the screen. In the first column of the table that appears enter the name of your Group. Groups are the way the address book organizes your contacts. For example, you may want to have some contacts in a group called "Friends" and a group called "Work". If this is the case enter Friends in the first row and Work in the second row of the first column of the table and click on the "Apply Changes" button. It is optional to fill in the second column of the table called "Notes". "Notes" is simply to remind you what the group is about. To the right of the table of the Group you have created you will now see "0 Records" in blue text, click on this and you will be presented with a table where you can enter the first name, last name and mobile phone number and the group which your contact belongs to. Click on the "Download Contacts" button at the top of the screen. A file called phonebook.xls will start downloading. 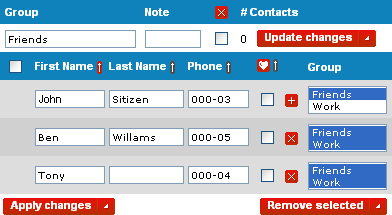 Open the file phonebook.xls and enter the details of your contacts under each column. 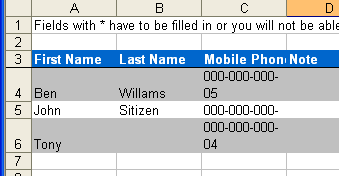 Please note that the column for First Name, Last Name, Mobile Phone Number, Group needs to be filled in for each contact or you will not be able to upload the spreadsheet. Once you have filled in all the required information on the spreadsheet save it. Upload the spreadsheet by clicking on the "Upload Contacts" button which is next to the "Download Contacts" button. Click on the gray "Browse" button that appears and go to the folder that you have saved the spreadsheet and click on phonebook.xls. 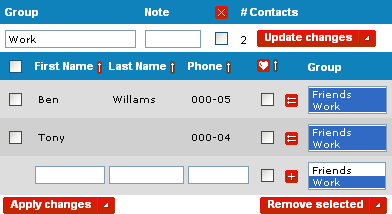 Click on the "Upload Contacts" button again and your contacts in the spreadsheet will be uploaded to your contact book. If you receive an error message and your contacts in the spreadsheet are not uploaded it usually means that you have not entered anything on one of the required fields mentioned in step 5. Click on the "Fast Import" button at the top of the screen. Click on "Review" button at the bottom of the page. If you are happy with the results click on the "Apply Changes" button. 16. My friend shares his mobile with his family. Can I have the same mobile number listed in my contacts book under more than one person? 17. I am sending a bulk SMS, can I personally address all my recipients? 18. How to add my contact to my favorite contacts list? 19. How do you send an SMS from email? 20. I am a software developer and I would like to integrate your SMS gateway to my website or application. What do I do? 21. Do you provide 2-Way SMS numbers? 22. How to use Auto Contact Group Creation? When you set up a contact group you can allow people to automatically join your group by sending an SMS with a keyword to one of our mobile numbers. For example, you are a real estate agent and you advertise a house for sale. Your advertisement can include our mobile number 0401 46 35 95 and a unique keyword (eg: "JOIN1234"). John Smith sees your advertisement and is interested in learning about the house that is for sale so he SMS "JOIN1234 John Smith" to 0401 46 35 95. John will automatically be added to your contact group for the house that you are selling. You can now SMS all the people in that contact group, including John Smith about the house eg: "Come to our house auction at 5pm today". If John Smith has since bought another house and is no longer interested in hearing about the house that you are selling, he can leave your contact group so that he does not receive any more SMS from you. To do this John Smith simply sends an SMS with the word "STOP1234" to the same number and his contact details will be deactivated from your contact group. If you want you can also give other members in the group rights to allow them to send Group SMS to all members in the group (eg: useful for sports clubs or social groups). Members of the group however, need to first have an account on www.smspal.com for this feature to work. On the New SMS page please scroll to the bottom of the page. In the option "I want to receive replies on" please select mobile number for communication groups. At the bottom of the New SMS page click on the "Contacts" button at the bottom of the screen. In the first column of the table that appears enter the name of your Group. Groups are the way the address book organizes your contacts. For example, you may want to have some contacts in a group called "House on William St". If this is the case enter House on William St in the first column of the table. To enable the Group so that people can automatically join the group by sending an SMS to the messaging number of the group please Select "Messaging Group" from the drop down menu and click on the "Apply Changes" button. It is optional to fill in the second column of the table called "Notes". "Notes" is simply to remind you what the group is about. To the right of the table of the Group you have created you will now see "0 Records" in blue text. Click on this and you will be presented with a table where you can enter the first name, last name and mobile phone number and the group which your contact belongs to manually. Alternatively, see: FAQ: 15. How do I enter my contacts in my contact book to learn how you can upload your contacts via an Excel spreadsheet our by cutting and pasting with our Fast import tool. To join to this group your subscribers have to send "JOIN8987 [subscriber name]" to number 0401 46 35 95. For example, "JOIN8987 John Smith". To remove themselves from the group, they have to send "STOP8987" to the same number. To send a message to a group, you have to send "SEND8987 message" to number 0401 46 35 95 or our webpage. For example, "SEND8987 Hello.Tomorrow we have a meeting at 10am". This message will then be sent to all the people in your messaging contact group. In case you forget the ID of a group, you can get list of available communication groups by sending "LIST" to number 0401 46 35 95. Please note that 8987 is a unique code that is allocated to each auto group. You will be assigned a unique code when you set up your group. It will not be 8987. In this example, 8987 is a unique number that we automatically assign to your group you may want to use a more meaningful keyword such as "Flowers". To do this go into the group by clicking on the number of records. Above the list of records you will see a box called Keyword. Insert the word keyword Flowers there. Now whenever your customers reply with the word "STOP8987" or "STOP Flowers" their contact will be deactivated. If they reply with the word "JOIN8987" or "JOIN Flowers" they will automatically join the group. 23. Can I used your service from my internet enabled WAP phone? 24. Can I give friends or employees access to my account or credit without giving them my password? 25. I sent an SMS with less than 160 characters but I was charged more than the number of credits per SMS then cost stated on your Pricing and coverage page. Why did this happen? It may be because you used non-alphanumeric or foreign or non-English characters in your SMS. Like an SMS which you send from your mobile phone the character count of 160 characters only applies to Latin characters (A�Z) and not for example to Arabic/Russian/Chinese/Japanese characters or characters with umlauts. Another reason for the discrepancy may be because you added a space or return key in your SMS so your character count was more than 160 characters. Please note that even if you are one character over the 160 character limit you will be charged for 2 SMS. It is important to also note that if you are sending a long message which has more than 160 characters, the character limit in the second and subsequent SMS will not be 160 characters as there is a header that is added by our software to tell the recipient's carrier that the second and subsequent SMS is part of the first SMS. This is the same when you send a long SMS from your mobile phone. We recommended that you should limit the number of characters to a multiple of 140 characters for the second and subsequent SMS in this case. 26. I have scheduled some SMS to be sent periodically at a later date and time. How do I cancel this? 27. How do I send SMS discount codes and special offers to my customers with an option for them to opt-out of future offers? When you send out an SMS message with us you can allow people to opt-out of receiving future messages from you. It is usually a good idea to provide people with the ability to opt-out of your SMS marketing campaigns. This is a legal requirement in some countries and is generally good practice so that you do not upset your customers by sending them offers that they don't want. In the first column of the table that appears enter the name of your Group. Groups are the way the contact book organizes your contacts. For example, you may want to have some contacts in a group called "Valentine's Day Offers". To set up this group enter the words Valentine's Day Offers in the first column of the table. To enable the Group so that people can automatically opt-out by replying to your SMS please Select "Offers Group" from the drop down menu and click on the "Apply Changes" button. It is optional to fill in the second column of the table called "Notes". "Notes" is simply to remind you what the group is about. 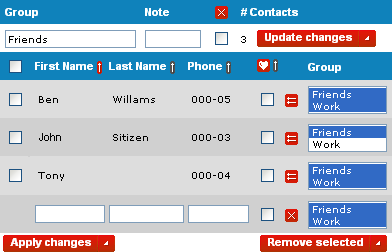 To the right of the table of the Group you have just created you will now see "0 Records" in blue text, click on this and you will be presented with a table where you can enter the first name, last name and mobile phone number and the group which your contact belongs to manually. Alternatively, see: FAQ: 15. How do I enter my contacts in my contact book to learn how you can upload your contacts via an excel spreadsheet our by cutting and pasting with our Fast import tool. To stop receiving offers reply with the words "OPT-OUT 8987" to number 0401 46 35 95. Contact details of people, that reply with the words, will be deactivated from the group. If the people that have sent "OPT-OUT 8987" to number 0401 46 35 95 change their mind, they can continue to receive more offers again by replying with "OPT-IN 8987". Instead of asking people to reply with the word "OPT-OUT 8987" in their reply where 8987 is a unique number that we automatically assign to your group you may want to use a more meaningful keyword such as "Flowers". To do this go into the group by clicking on the number of records. Above the list of records you will see a box called Keyword. Insert the word keyword Flowers there. Now whenever your customers reply with the word "OPT-OUT 8987" or "OPT-OUT Flowers", their contact will be deactivated. What this means is that they will not receive any further marketing messages from you the next time you send another SMS message to the people in the group. 28. How do I set up SMS templates? If you regularly send the same SMS message, you can use our template feature. You can set up an unlimited number of SMS templates. To set up a template please sign in to our website with your username and password and go to the "New SMS" page. Towards the bottom of the screen, please tick the "Please use my template message" tick box. Once you have ticked the tick box a drop down menu will appear showing existing templates that are ready to be used. To set up a custom template, please click on the "Edit Template" button which is to the right to the drop down menu. Insert a title for your template to remind yourself of the content of the template and insert the wording of the template and click on the apply changes button. To delete an existing template, select the template you want to delete and click on the "Remove selected" button. 29. Can I send SMS messages through your service that is in Russian, Arabic, Chinese or Japanese?